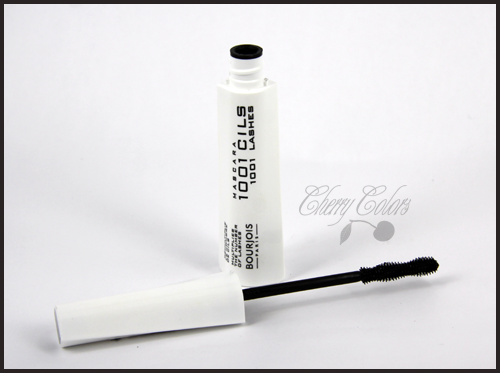 Review: Bourjois 1001 Lashes Mascara Black - Cherry Colors - Cosmetics Heaven! It's been a while since my last review and I honestly have no excuses :). Last week I got myself this gorgeous looking mascara (it was in a package, with 3 other things, so it's totally worth it!). Reaches every single lash regardless of their length or location. Say goodbye to mascaras that only thicken or lengthen the lashes! Bourjois goes further and multiplies your lashes*! This high-tech mascara visually multiplies the number of lashes for a full fringe of eyelashes.. more dense, more beautiful. The revolutionary patented** double helix brush has astonishing powers: with its twelve rows of bristles, it works on every single lash, even the very smallest. In just one application, every lash is reached and fully coated from root to tip without clumping. It's lengthening, rich in pigments glide-on formula intensifies and gives maximum body to all your lashes. Enriched with natural waxes, vitamin E, and C derivatives, it is suitable for sensitive eyes. As you can see the wand is interestingly shaped, which kind of scared me off at first. But then, I actually used it and WOW! First let me show you my bare lashes (they are disgusting, like if nothing is there!). I then applied one coat of mascara and took some more pictures. Much much better. But still not quite it. WOW! That's what I wanted, yeah! It was pretty easy to apply, even in the inner corners when I usually don't put mascara (that's too much of a hassle). The texture is good, not too dry not too moist either. And there's one thing that I absolutely love! The fact that when you take the want out, there's no mascara residue left on the edge. At all! This mascara is so clean, that it's hard to believe. + The packaging, it's something new. + The wand! Works perfectly! +It's not tested on animals. + 2 layers of it and my lashes look divine! + Stays on all day! + Gets off easily (with water). I mean wtf is that part anyway? - Maybe the price. But actually, it's not that bad. - It's not waterproof, but it won't budge when you sweat. - Doesn't give a lot of volumes. Of course, it DID burn when it touched my eyes in its melted state. But that happens with every mascara, so I don't worry too much. I usually don't like mascaras that have in their ad a girl with OBVIOUSLY fake lashes on... Or that promise way too many things. But this time, I made an exception. I LOVE IT! I Think I found my new love, and if anything goes wrong with it, I'll surely let you know! It actually didn't budge when I sweated like a pig, but at the same time it went off really easily with just plain water.